Have you been watching the new hit series Pan Am? It's on late Sunday evenings around here and I've managed to see the first two episodes. I love it. It's fairly well done in the wardrobe department. The sets look authentic. And I must say, I'd rather watch that that most of what is available on our TV these days. 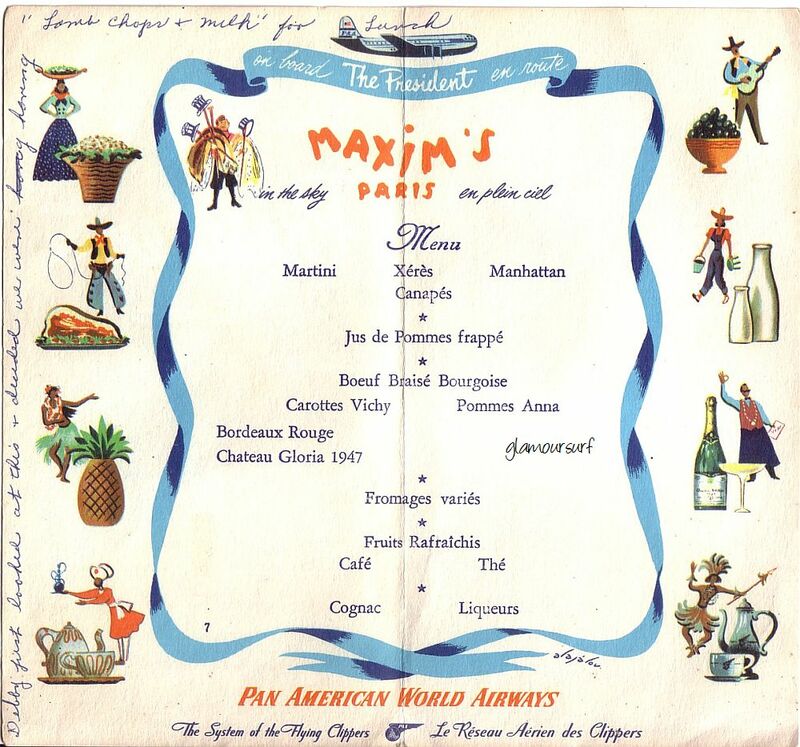 I was so excited today when I found this menu postcard from Pan Am, dated 1952. 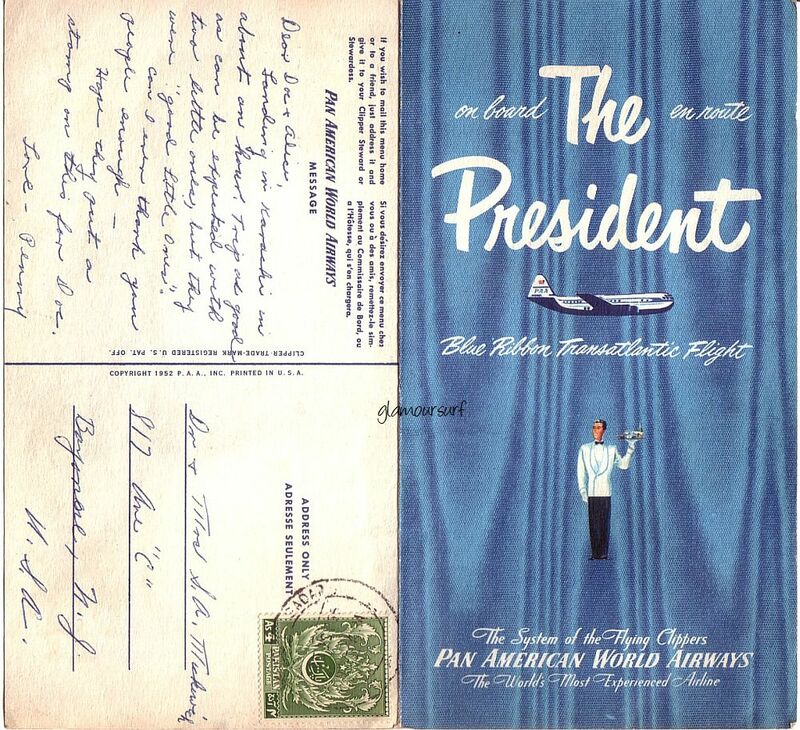 It's "on Board the President, Blue Ribbon Transatlantic Flight". 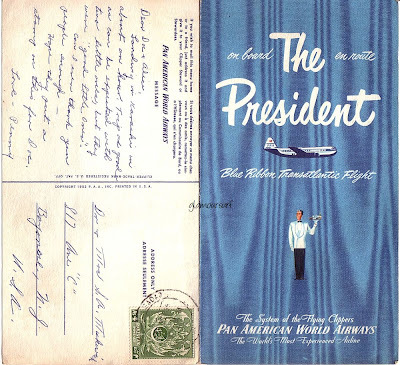 The President was Pan Am's first class service. I was amazed to learn that Pan Am had a relationship with Maxims where they would supply most of the first class food, flash frozen. Oh la la. And check out the wine being offered, a Chateau Gloria 1947. What makes this so special though, is the writing on the postcard and around the menu. Landing in Karachi in about an hour. Trip ok good as can be expected with two little ones, but they were "good little ones". Can I even thank you people enough- Hope they put a stamp on this for Doc. Love Penny. Debby first looked at this and decided we were having "Lamb chops & milk for lunch. It's all fun. I've put it up on EBAY, we'll see if it goes. There's a fun site dedicated to Everything Pan Am. Worth a visit! At least check out the show. thanx for reminding me ive been interested in watching this show because its so vintage like i love the wardrobe..gotta catch the next episode!! Love it! Am very intrigued by the show. If only the flight attendants of today - men and women - looks this glamorous. And the menus too! I remember the amazing glamour and prestige that stewardess jobs had at that time. What girl didn't want to grow up and be a stewardess?! :) This show captures that era beautifully! I agree that the costumes, hair, makeup, and sets are wonderfully authentic. 1942 - More Sirens Needed!